Don't you hate it when you bring home an avocado just to find that it's gone bad already? I don't like when this happens to me. Usually, you slice an avocado right when you are ready to eat it, so you don't know what's inside. But, there is a solution! While at the grocery store look for these tips on how to pick the right avocado, so you end up with the perfect one. First, begin with selecting a Florida or California variety. Check the stem of the fruit by removing it. If it's brown underneath the stem, it means it is an over ripe avocado, and you will find brown spots inside. If the small round trail under the stem is a yellow-green color, it means the fruit is still green. But if you find it's just green it means you found yourself the perfect avocado! Avoid overly soft avocados, since these are most likely gone bad already. You will know if the avocado is ripe if it's pressure-sensitive, you will feel that it is soft. If it's not ripe yet, meaning it will still be very firm, it will taste more like a raw potato. So if you do end up buying a not ripe avocado, put it on the counter for 3-4 days. 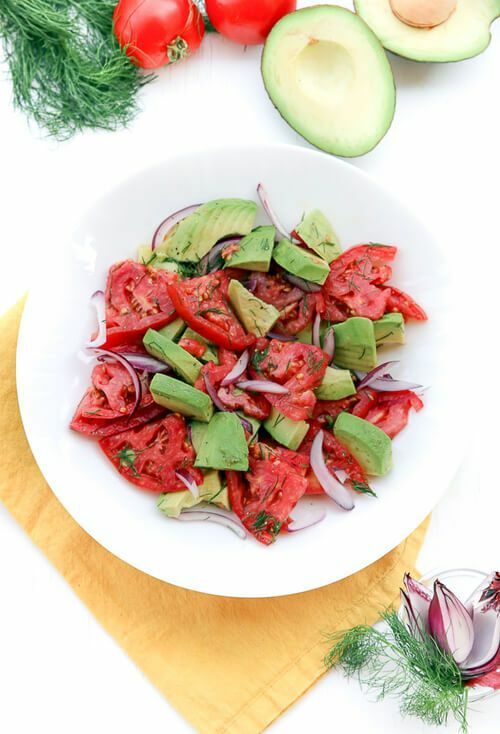 SO WHAT ABOUT THIS CLEAN EATING HEALTHY TOMATO AVOCADO SALAD RECIPE? I have just returned from Barcelona, Spain, and I am craving healthy food, particularly avocado. Although, I tried salads there, it's just not the same when at home. My mom gave me some fresh tomatoes from her garden, so it was the perfect time to make this delicious salad. These avocados are high in healthy fats and tomatoes battle cancers. Peel and slice 1 avocado. Mix cut ingredients with juice from 1/2 a lemon, 1 Tablespoon extra-virgin olive oil, pinch of salt (or to taste), pinch of ground black pepper. Chop 1 stem fresh dill, add to the salad and enjoy!